That’s right. You’ve probably never heard of that country before. That’s partly why we picked there to visit; the other reason is because it has an incredible landscape that you’d have to see to believe. We decided about one year ago on the fly that we would visit a really obscure location that we might want to bring a photo tour to one day. That’s when I pulled out my phone and showed Paul photos of Svalbard, Norway, and a photo album from a backpacker who visited the Faroe Islands. 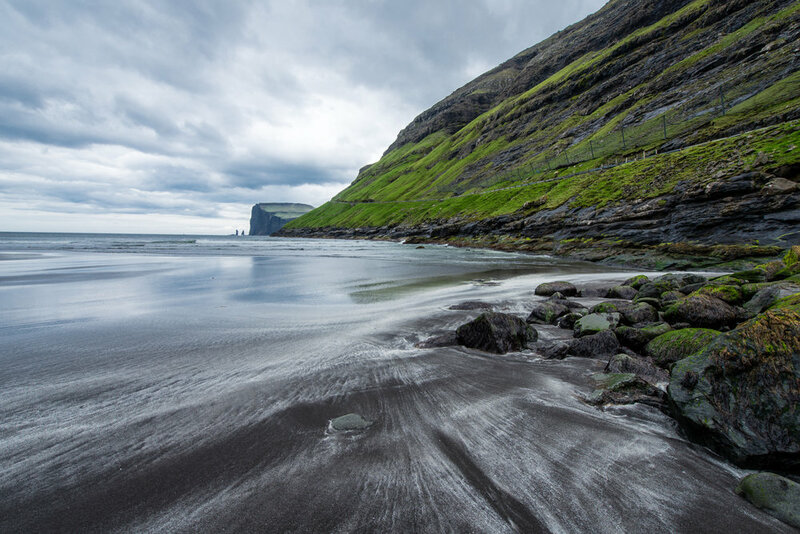 After reading copious reviews and blog entries and image searching, we agreed on the Faroes. And months later our flights were booked for June, 2017. And the trip was great; well, It was more than great. We made some incredible images, experienced a new culture, and made lots of new memories. They are an autonomous country within the Kingdom of Denmark. 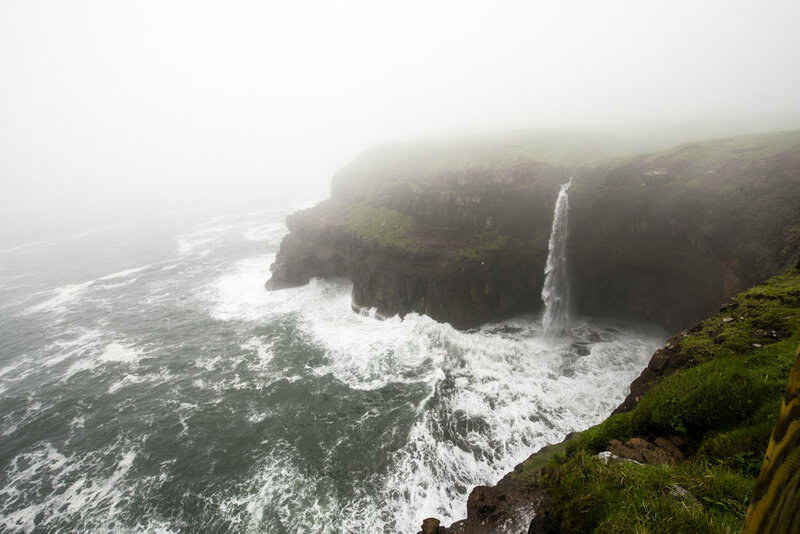 So yes, the Faroes are an interesting and beautiful place. But it was a hell of a trip to get there! Because it is so remote (and it only has one airport), our route included more stops than usual. We flew from Boston to Reykjavik, Reykjavik to Copenhagen, and then backtracked from Copenhagen to the Islands. We spent just under 10 hours for a layover in Copenhagen, which we spent exploring. We visited a massive botanical garden, famous Nyhavn, The Marble Church, the Little Mermaid (which was a zoo) and Rosenborg Castle which was truly mind-blowing. The Rosenborg was so fascinating we need to dedicate three more sentences to it. It was originally built as a summerhouse for the Royal Family of Denmark, and is now a museum and houses the Royal collections. We planned to spend an hour tops, but stayed for more like three gazing at what must have been worth billions of dollars in jewelry, weaponry, and intricately carved ivory and nautilus shells, and other ridiculous things you wouldn’t see anywhere else, including the Crown Jewels of Denmark. It was a very worthwhile stop; for $18 you can experience 350 years of royal Danish history and in the U.S., you can pay twice that to see a mansion in Newport. 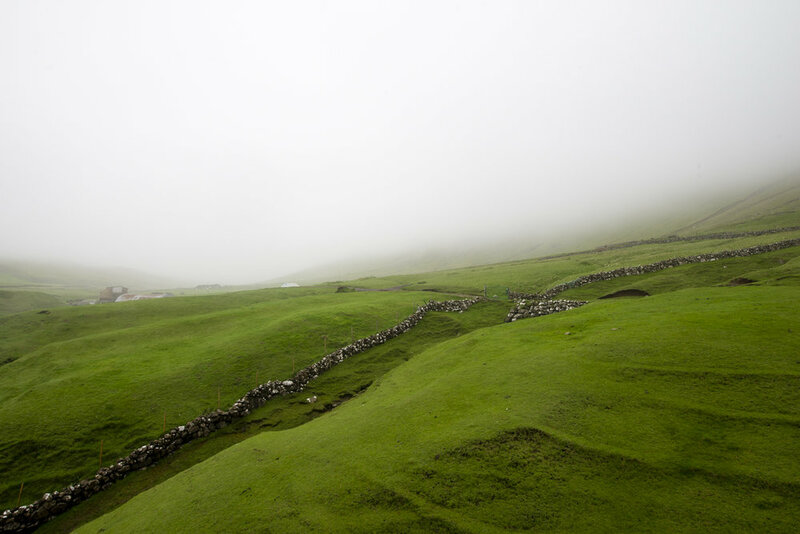 Upon arriving in the Faroe Islands, we went to find our rental car. We were told to “just pick it up, keys in the glovebox.” No person, no desk, no papers to sign. Weird! We literally got in the car and drove off. Guess they do it a little differently here. We had a handy-dandy map of the islands and headed towards our first shoot at Saksun for some sleep. On the way we stopped at the grocery store “Bonus” and purchased some local delights: tunsalat (tuna salad), skinke (which is ham - or so we think), and some great locally made white bread. One of the first and recurring challenges we found was figuring out when to sleep and when to wake up. In June, the sun sets at 11 PM and rises around 3 AM, with no real night in between. Arbitrarily, we decided to wake up at 8 in Saksun and start shooting. There was so much to see. Everything was so densely green, there were waterfalls cascading down the mountains all around us, and all of the buildings had turf roofs. The mountains have a near-permanent shroud of clouds around them which made for some dramatic images. We then visited Kirkjubour, which is considered the cultural center of the Islands. The weather was perfect and we found a meadow full of wildflowers beside some turf structures by the water. Amazing! 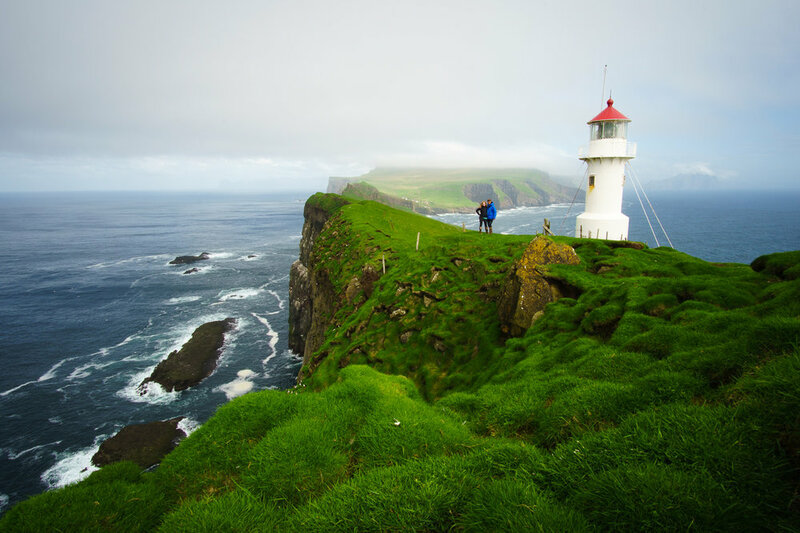 The great thing about the Faroes is how close everything is. We had anticipated a long day of driving ahead of us, but upon putting the next location in our GPS, we found it was only an hour away. 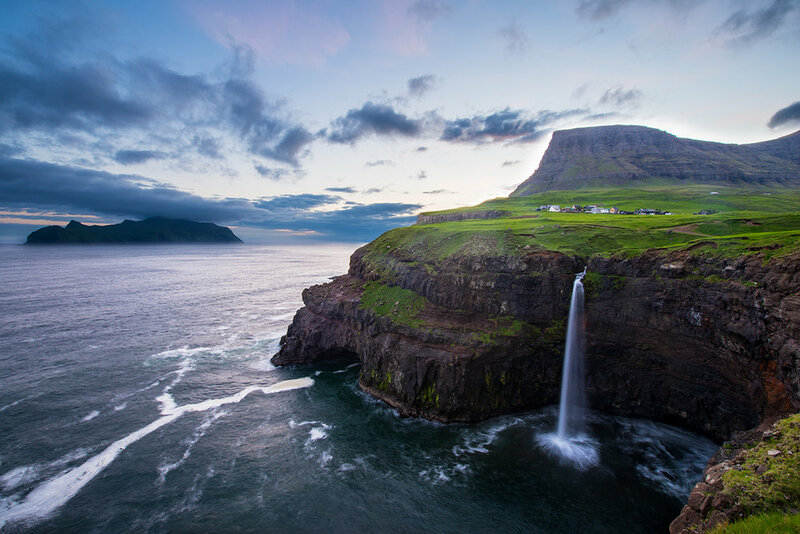 As it turns out, no two destinations in the Faroes are more than 2 hours apart. Think of it like Cape Cod, spread out onto 18 different Islands (more or less). Looking back at our Arizona adventure, where driving a “mere” 4 hours was no problem at all, this was quite a contrast. Perspective is everything: We suddenly found ourselves complaining when something was more than 45 minutes away. So, onto our next destination, Funningur, a whopping hour and 15 minutes away! At this point, per usual, Allie Richards has taken ill, as she has a tendency to do anytime we go somewhere that’s colder than she just was. Like in the Oregon Trail - Billy gets Typhus — again. Some unexpected purchases ensued: An 8-pack of travel tissues (for the equivalent of about a dollar U.S., because they didn’t have any smaller quantities), menthol vapo-rub, and some Tylenol (fortunately the same anywhere in the world). 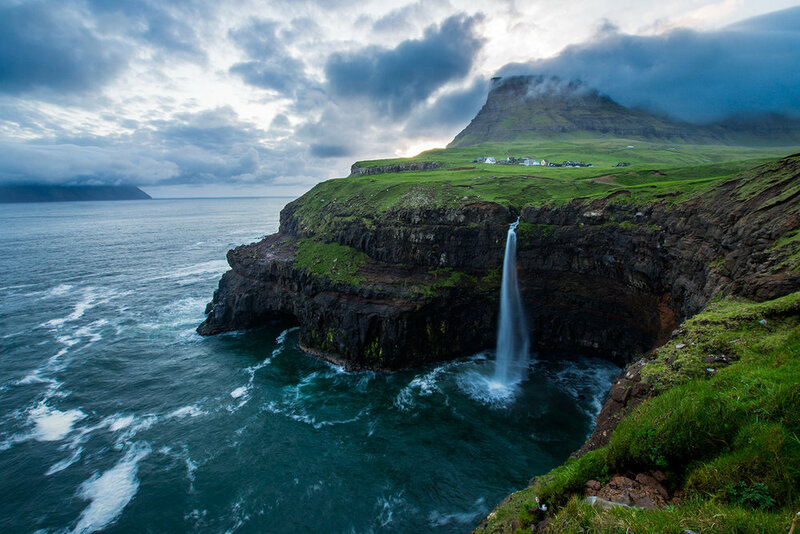 Gjov, Faroe Islands. All the towns were very pretty. Out-of-commission Allie proceeds to miss out on a panoramic sunset shoot at Funningsfjordur - Fancy word for Fjord at Funningur. 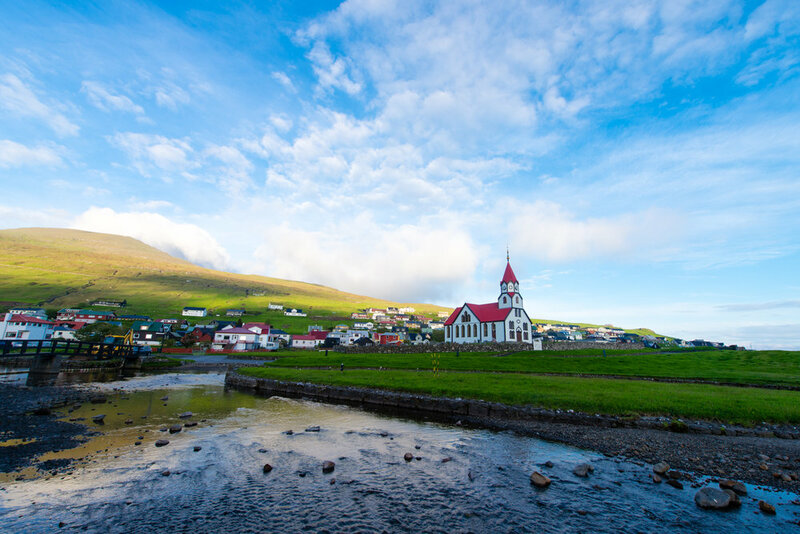 We found a great little church at Funningur called Funningskirkja, meaning church at Funningur - I think you’re getting how the Faroese language works at this point. As great as the church looked at sunset, we thought we’d try it again at sunrise - which was fortunately only 3 hours away. This was our first taste of the very short night, or super-long twilight. After a short nap, we were up at “the crack of dawn”, realizing that sunrise was really just an extension of sunrise. So, on the right day, you’ll just have four straight hours of amazing light and color to work with. No complaints here. We like to make friends wherever we go, but most of the time the only locals who want to be friends with us are dogs. Not even the sheep want to be seen with us. We’d heard about this incredible lake that hovers above the ocean, so had to see it for ourselves. 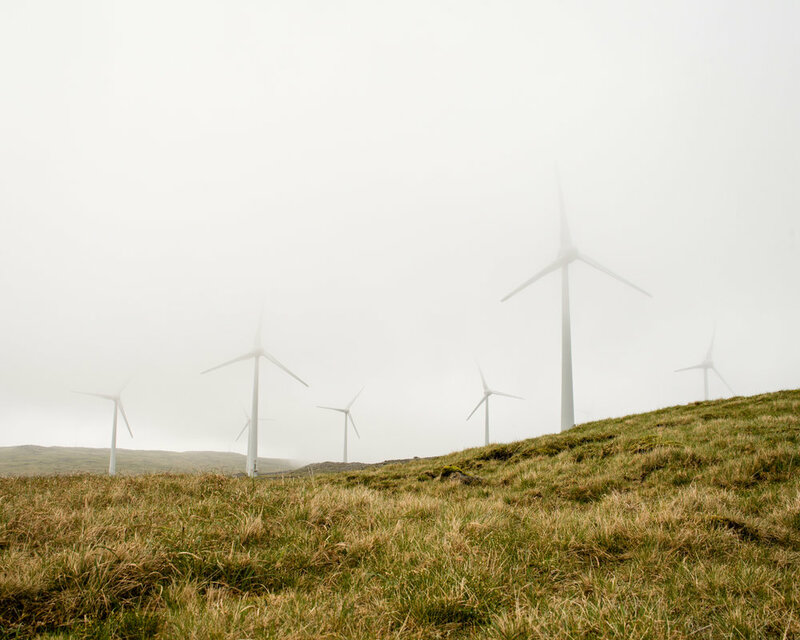 It required a moderate amount of hiking, which is when we realized that the Faroese definition of “hike” was different from ours. We tramped through a large sheep pasture for a few hours to get to where the lake meets the ocean via a waterfall. Silly Allie had forgotten to bring water, and even considered drinking the water in the poop-infested streams. In a trip full of highlights, the highest of the high was our day trip to the isle of Mykines, accessible only by ferry. 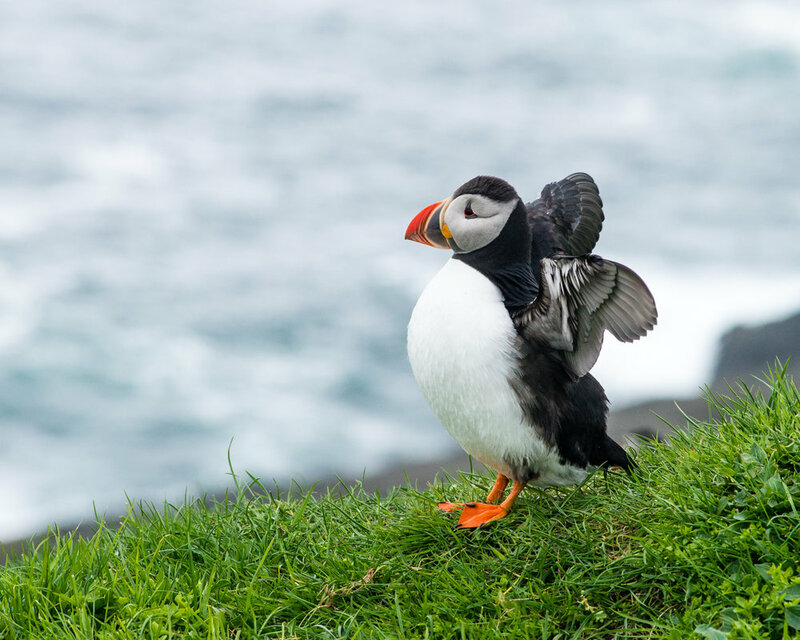 Mykines is home to the Faroes’ largest puffin and gannet colonies, and if we were birders, we’d call it a birder’s paradise. Fortunately we’re just photographers, so we can settle for calling it a photographer’s paradise. 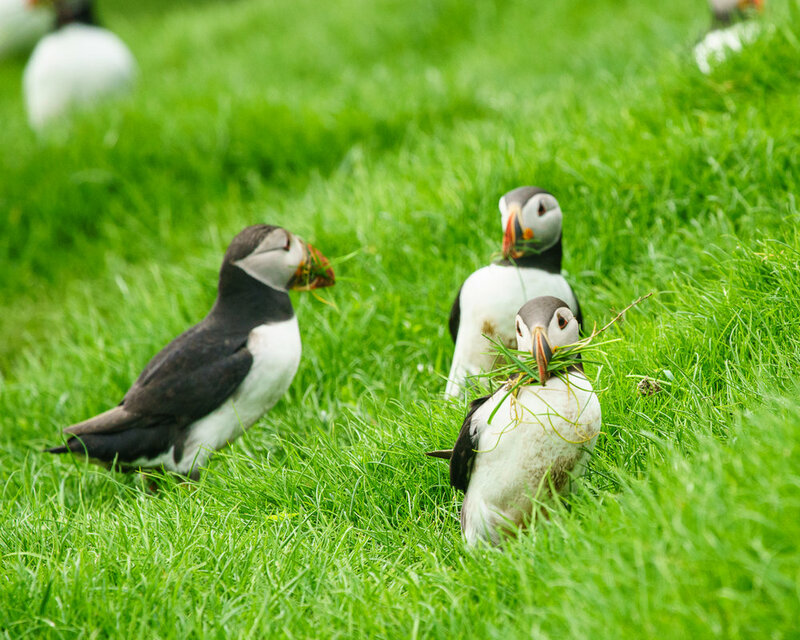 Paul has been to puffin colonies in Maine before, but this was the first time we’d ever gotten this close to the puffins themselves. We were literally able to sit on top of their burrows and get a courtside seat to their nesting behaviors! Oh, and there was this awesome lighthouse at the end of the island. 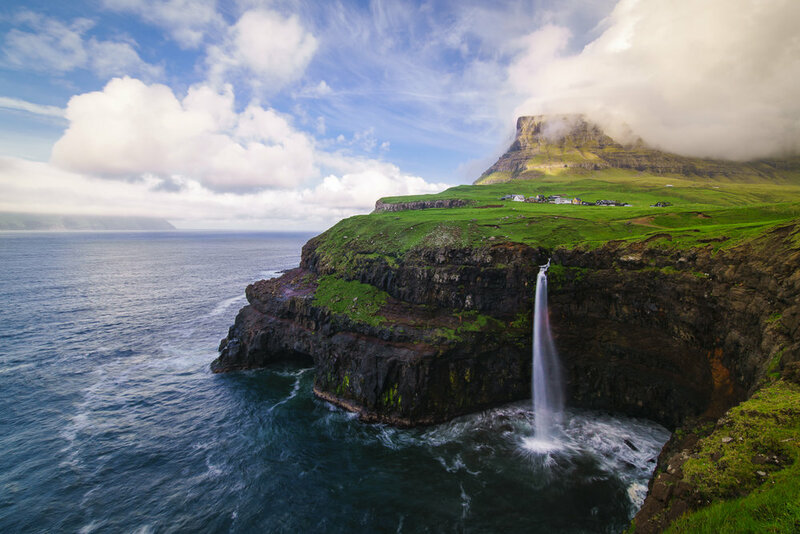 Part of the identity of the Faroe Islands is the sheep population (there are approximately 70,000). So we made sure to fully document the sheep phenomenon and adorn ourselves with sheep products, like this amazing locally made hat. 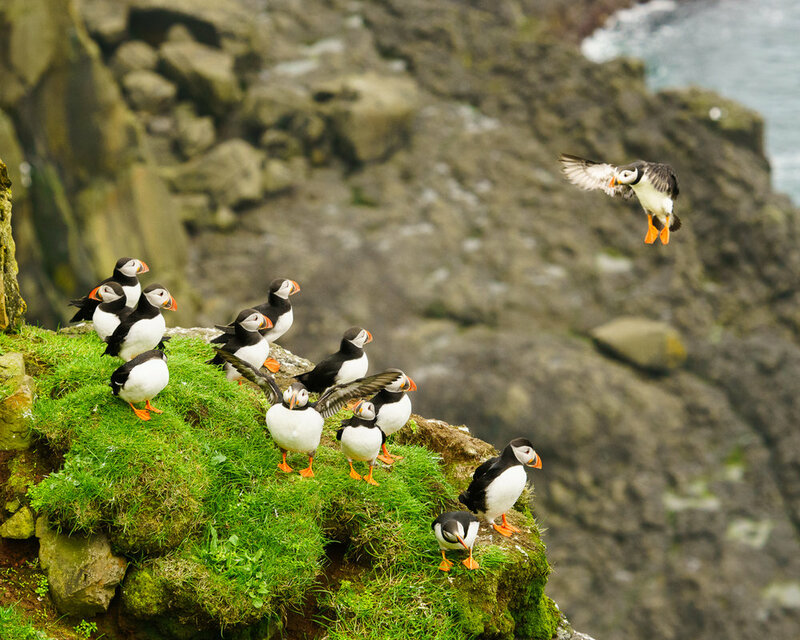 We took for granted that our arrival on Mykines was smooth and effortless. But when it was time to leave, we realized how quickly the mighty North Atlantic can turn against us. And after some hours of patience, we made it back to the mainland (or, other islands to be technically correct). The next day, we decided we would do an ‘easy’ hike from Tjornuvik to Saksun. Tjornuvik is a beautiful beach cove with views of ‘The Giant & The Witch’ sea stacks that it is known for. After some photographing, we saw a tour group of older folks just returning from Saksun and we figured it couldn’t be that hard. It was only listed as 3.5 miles. On our way up, we saw a woman being carried by two men back to town, and thought maybe she hurt herself, or was just too tired from the hike. Turns out, the hike couldn’t have been ‘just’ 3.5 miles at all. We made it to the high point at the top of the mountains, to which we assumed that our final destination was just on the other side, below us. Nope! We found we were only halfway according to our GPS. That poor, poor woman! We didn’t make it to Saksun, but at least the view was nice! There was a lot of material produced on this trip, so here are some more images that didn't really fit! The sheepdogs were always playful! Loving the 'tude in this one.